University of California-Santa Barbara received a A+. U.S. News & World Report's ranking of 10 out of 117 of National Universities Top Public Rankings was a major contributor to this grade. The laid back University of California's Santa Barbara campus enrolls about 19,000 undergraduate students in a variety of programs in the liberal arts and sciences to business and technology. Student's claim the Santa Barbara campus has one of the nation's most active social scenes, and report that no UCSB experience is complete without a weekend party at the notorious Isla Vista area of student residences. Describe the type of student who should attend University of California-Santa Barbara. Why? I feel any kind of student should attend UCSB, as long as they are there to get the education they long for. What is a typical University of California-Santa Barbara student like? Describe the type of person that should attend University of California-Santa Barbara. 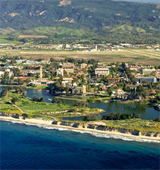 What are the top 3 reasons someone should attend University of California-Santa Barbara? The top three reasons would probably be for the gorgeous location of the beach, the quality of education and the atmosphere that the people create where it is friendly and welcoming. What was a typical University of California-Santa Barbara student like in high school? Describe the type of person that should attend University of California-Santa Barbara. Those wishing to be future Gauchos need solid test scores, GPAs, and extracurriculars. What are the top 3 things that students do for fun at University of California-Santa Barbara? The top three most popular things to do around Santa Barbara are to surf, play table and die games, and to get outside and soaking up the sun! 96% of students graduated in the top tenth of their class. Total stated tuition is $11,220, in-state and on-campus, before financial aid. Learn more about financial aid at http://www.finaid.ucsb.edu/. Estimate the net price for you at http://www.finaid.ucsb.edu/prospective/aidestimator.aspx. The typical (median) early career salary of University of California-Santa Barbara graduates is $46,300, according to Payscale. University of California-Santa Barbara participates in the NCAA Division I-AAA for college athletics. Want more info about University of California-Santa Barbara? Get free advice from education experts and Noodle community members. What are 5 adjectives that describe a typical student at UCSB? Every person is a complex individual, but the vibe from most people I've met here lead me to these 5 adjectives: intelligent, fun-loving, caring, passionate, and open-minded. What do you like about UCSB's campus and culture? Does University of California Santa Barbara have an advisor program? How are academic advisors assigned? Do students go to UCSB because they love the beach?